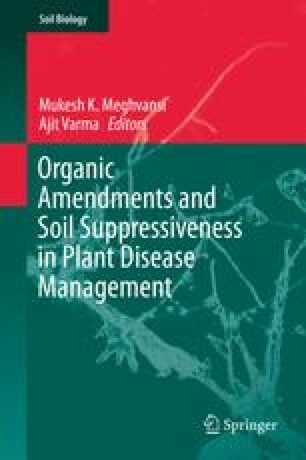 The impact of organic amendments on the soil microorganisms and plant growth and health in conditions of organic agriculture of Northern temperate climate was analyzed. Some case studies dealing with green manure or vermicompost amendments are discussed giving deeper analyses of the vermicompost impact on plant growth. The first case study is about the impact of green manure on soil microbial populations and soil suppressiveness against such pathogens as late blight, potato scab, and black scurf of potato in organic agriculture. The second case study is about the use of vermicompost in organic starch potato cultivation. Significantly higher numbers of all groups of analyzed cultivable microorganisms were observed in organic agriculture fields in comparison to conventional fields. Results obtained by molecular methods regarding fungal diversity did not show such an increase. Controversial results about plant health, in terms of disease suppressiveness, have been obtained. The possible acting mechanisms of the vermicompost on plant growth are discussed. Our studies raise particular concerns about the vermicompost. Definitely, the unique nature of organic amendments in each case must be taken into account. Further studies are needed to explain the impact of green manure and vermicompost on the plant health.